Warning: There may be some spoilers in the review below, nothing too major. Despite the poster for Solis being nearly identical to the upcoming First Man film. This is a very different film, and in fact I think the Solis poster is much better. Solis is one of those rare films whereby we only get one living character on screen for the entire film. Asteroid mining engineer Troy Holloway (played by Steven Ogg, who you may recognise from the GTA game) has woken up on an escape pod, in space, and that pod is on a one way journey to the Sun. Holloway is alone (except for a dead colleague), and his only help is Commander Roberts who he speaks to through a headset, who is his only hope for rescue. Hollyway must overcome and survive everything from being frozen to death to being burned alive, not to mention rapid oxygen depletion. Now this is not some horror film with aliens etc, this is a pure psychological thriller. 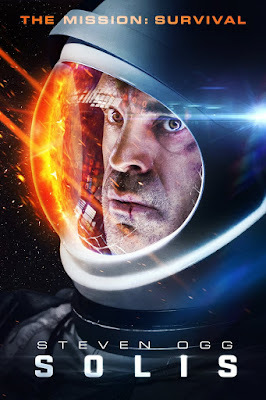 And in the style of great one person films like Buried or Moon, we have to rely on the excellent performance of Steven Ogg to carry us through. Where as a similar type of film in Gravity relies on jaw dropping special effects, Solis proves that you don't need 9 figure budgets to make a solid enjoyable film set in space. That's not to say there isn't some great shots here. One that stuck in my mind is as we view the escape pod from behind, surrounded by the darkness of space, only for the camera to pan back and the sun to appear, previously eclipsed by the pod. And then the sheer power and brightness of the sun to overtake the screen. There is a very decent score too, although perhaps it goes too big too soon, it does add to the film throughout as opposed to taking away anything. Now I have read a few reviews of the film, and I see a lot of people disappointed with the ending, personally I don't need every little thing explained, written out and showed to me. I like a bit of mystery, a bit of the unknown. But sadly we live in a time whereby film makers often feel the need they have to explain everything and give a complete and full beginning, middle and an end, to satisfy a hungry audience. Personally I like the intrigue, the unknown, this allows me to ask questions, to talk about things, to examine what I do not know, what I did not see. So the ending I was perfectly fine with. I thought the film was the perfect length for the kind of film it was. The acting by Ogg was great, and overall I enjoyed the film. It wont be for everyone, and those who only enjoy huge special effects and every little thing laid out for them probably wont enjoy it, but for those of you who have a brain, imagination, and enjoy a good story being told, then give Solis a go, you might be pleasantly surprised.